The 1oz American Gold Eagle is an official gold bullion coin of the United States, authorized under the Bullion Coin Act of 1985. It was first introduced in 1986, and soon became a leading choice among investors across the world thanks to its supreme quality and design. The one ounce coin is the largest gold bullion coin produced by the US Mint and is composed of 91.67% gold, with the balance being copper and silver. This 22 karat alloy is traditionally known as crown gold and is a traditional English standard that dates back several centuries. The coins are guaranteed by the U.S. government to contain the stated amount of weight in troy ounces and are accepted all over the world, thus have a high liquidity value. Why should I buy the 1oz American Gold Eagle? 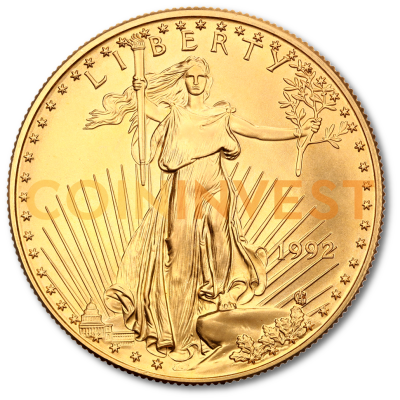 One Ounce American Gold Eagles are an extremely secure investment and a popular way of buying investment gold coins of tangible beauty. Recognized as America's official investment-grade gold bullion, the Gold American Eagle is easy to purchase and even easier to convert into cash. With their powerful Doric design and impeccable quality, 1oz American Eagle Gold bullion coins provide investors with a perfect option to add physical gold to their investment portfolios. Although some yearly issues can be slightly rare, one ounce gold Eagles normally track the spot price of gold in terms of value. The American Gold Eagle 1oz coin has an exact weight of 1.0909 troy ounces of 22 karat gold, the alloy being employed to ensure a minimum of scratching and marring. The coin is 32.70 mm in diameter, 2.87 mm thick and has a nominal value of $50. The classic design of the obverse side is captured in the graceful "Striding Liberty", first created by Augustus Saint-Gaudens for the 1907-1933 $20 U.S. Double Gold Eagle coin. The image shows Lady Liberty in full-figure holding a torch (knowledge and power) and olive branch (peace) with a minute Capitol building in the background resembling a mintmark. Inscribed we find the word "LIBERTY", together with the year of issue. Gold Eagles minted 1986–1991 are dated with Roman numerals. In 1992, the U.S. Mint switched to Arabic numbers for dating Gold Eagles. The reverse was designed by Miley Busiek and features a female eagle and her hatchlings with her companion flying high above. Inscribed are the words "UNITED STATES OF AMERICA", "E PLURIBUS UNUM" (Out of many, one),and "IN GOD WE TRUST" as well as the gold content and the face value of the coin. American Eagle gold bullion coins have an outstanding reputation for quality and purity, taking their rightful place among some of the world's most valuable gold bullion coins. Special dies struck multiple times make it so that the softly frosted, detailed images appear floating on a mirror-like surface. They're minted each year by the United States Mint according to demand. This policy has led to a high fluctuation in mintages. While the usual number of coins printed every year exceeds 1 million pieces, low mintages are not uncommon: 200,000 coins were released in 1993 and 1994-96, while only 140,000 were issued in 2001 and 2007. These coins may have a small collective value. On the other hand, an astounding 1.5 million Gold Eagles were issued in 1998-9 and 2009. For the financial protection and security of dealers and investors, the American Gold Eagle coins undergo strict quality assurance measures and are in perfect condition when leaving the mint. The Gold Eagle's popular design along with its fame as a secure way of investing in physical gold brought into the market all sorts of copies and fakes. Due to the design's remarkable detail and quality, counterfeit coins had no chance to meet the standards as tungsten is very brittle, and the coins cannot be stamped properly and convincingly. An experienced dealer will immediately find flaws, the most common being a skull- faced Lady Liberty. How do I sell 1oz American Gold Eagles? If you have any 1oz American Gold Eagles coins for sale, do not hesitate to come in contact with a member of our staff who will be happy to discuss a price with you and prepare a fixed fee offer for a limited time only. We will send your confirmation of the offer by email.